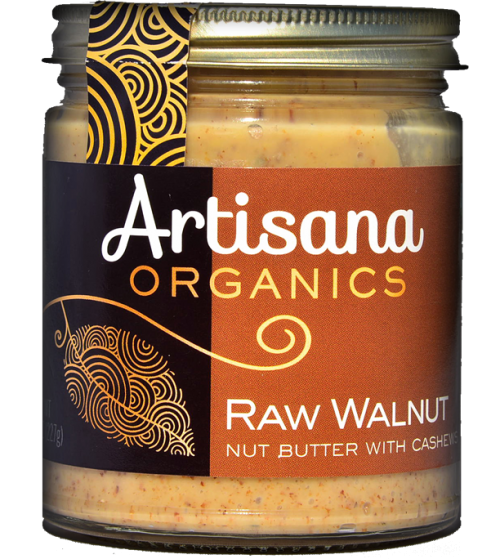 Premium hand-selected golden organic walnuts are blended with organic cashews to create this smooth, mildly sweet yet intense walnut butter by Artisana. Walnuts are one of nature's most nutrient-dense foods. Beyond being an excellent source of omega-3 fatty acids, walnuts are rich in healthy protein, the full spectrum of B vitamins (excluding B12), vitamin E, iron, magnesium, and potassium. 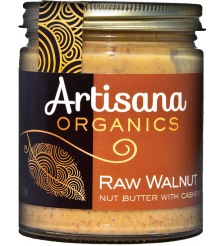 Artisana walnut butter is carefully handcrafted from fresh (not roasted) nuts, and is created using a low-temperature process (below 115° F.) that preserves heat-sensitive nutrients. Only 100% certified organic walnuts and cashews are used to make this delicious walnut butter. Notably absent: pesticides, artificial flavors, colors, preservatives, stabilizers, added oils, GMO's, peanuts, gluten, and dairy. Notes: Oil separation occurs naturally; stir before serving. Are the nuts soaked before being made into nut butter? The raw nuts are not soaked before being crafted into tasty, healthy, organic, raw nut butter. All of the nuts used can sprout or grow when germinated/soaked. Soaking the nuts adds substantial water (even after dehydrating), and adds bacteria and moisture, which reduces shelf life to just a few days. Why are there cashews in Artisana Walnut Butter? Cashews make the walnut butter more creamy and spreadable. Cashews also act as a natural sweetener to temper the natural mild bitterness of the walnut skins, which are included for their health benefits. Does Artisana Walnut Butter need to be refrigerated? Artisana Walnut Butter does not need to be refrigerated for more than 18 months after they are produced. If you plan on using Artisana Walnut Butter within a month of receiving it, refrigeration is not necessary, provided that you use only clean and dry utensils in the bottle. It's easier to use the butter when it's at room temperature. If you don't plan on opening the jar for a month or longer, it's best to refrigerate to prolong freshness. Another tip: Be sure to give the nut butter a good mix after opening for the firs time - this helps to evenly distribute the healthy raw oils in this product. What are some different ways to use Artisana Walnut Butter? Please note that this delicious walnut butter only comes in an 8-ounce size. Oil separation occurs naturally, stir before serving.